The time Alexander Griboyedov spent among the upper classes at his family's estate heavily influenced his masterpiece Woe from Wit. The Russian country estate has long been associated with literary classics. There are few 19th century writers who did not have some intimate connection with that milieu, from Leo Tolstoy’s beloved Yasnaya Polyana to the Dostoevsky family’s modest Darovoye. Among those writers must be included Alexander Griboyedov (1795-1829), a close acquaintance of Alexander Pushkin and author of the satiric comedy “Woe from Wit,” one of the undying classics of Russian literature. Indeed, the country estate, usadba in Russian, has played a major role in Russian history and culture generally. With the cataclysms of the 20th century many of the estate houses, large and small, vanished, whether through outright destruction, vandalism or neglect. And the losses have continued to the present. Yet there are examples where perseverance and dedication, skill and luck have led to the resurrection of an abandoned property. Such is the case of the Griboyedov family estate of Khmelita, located some 20 miles north of Vyazma in Smolensk Region. Owned by the princely Buinosov-Rostovsky family during the 16th century, the estate was acquired at the end of the 17th century by Semyon Griboyedov, a military commander in the 1680s. In 1747, Khmelita passed into the hands of Fyodor Griboyedov — also a military officer — who began a major reconstruction of the estate in 1753. The grand mansion is a rare surviving example of the baroque style prevalent during the reign of Empress Elizabeth I (1709-1761), with stuccoed brick facades painted in a pastel color with white trim. The facades are marked with paired attached columns, curved pediments, circular and oval windows. The main floor of the interior consisted of enfilades of state rooms, with a two-story hall in the center. The park façade opens onto a central terrace with a graceful curving staircase descending on either side to the landscaped park. In addition to the mansion, the expansive ensemble includes four attached service wings as well as a church dedicated to the Kazan Icon of the Virgin (1759). To get to Khmelita take a regular train from Moscow (Belorussky railway station) to Vyazma. Than you need to take Vyazma-Pigulino marshrutka (mini-bus) and get off in Khmelita. The trip takes 2.5 hours. At the beginning of the 19th century, Khmelita was owned by Alexei Fyodorovich Griboyedov, whose sister Anastasia had married Sergei Griboyedov, a retired army officer of little means. Anastasia Griboyedova placed great store in the authority of her wealthy brother, who apparently served as a surrogate father for her son Alexander, born in January 1795. Thus the young Alexander Griboyedov was a frequent guest at Khmelita, particularly in the summer. Through his uncle’s position in Moscow society, Griboyedov was well placed to observe the manners and mores of the Russian nobility. Griboyedov applied this knowledge to deft satiric effect in his verse play Woe from Wit, completed in 1824 but published only in brief fragments during his lifetime because of censorship. Griboyedov did not spend much time at Khmelita as an adult, however. After military service during the war against Napoleon, Griboyedov moved to St. Petersburg in 1815 and in the summer of 1817 entered the diplomatic corps. In 1818, he was offered a diplomatic posting to the United States. He instead accepted a position with the mission to Persia, whose tense relations with Russia ultimately led to war. At the beginning of 1823, Griboyedov took a leave from diplomatic service and moved to the Moscow area, where he contined work on Woe from Wit. He returned to the diplomatic corps in 1825 and played an important role in diplomatic negotiations during the Russo-Persian War (1826-1828), which concluded with the Turkmenchay Treaty. In January 1829 Griboyedov returned to Persia as the head of the Russian mission, which was based at Tabriz, but he made the fatal decision to accompanied a diplomatic group to Tehran, where passions were still inflamed by the terms of the treaty. On Jan. 30, the Russian mission was stormed by an enraged mob. All but one of the 38 Russians perished. Griboyedov was killed during the fighting and apparently thrown from a window. Griboyedov's memory lives on at Khmelita, however. During the latter part of the 19th century, the grand Khmelita manor entered a period of decline until 1894, when the estate was purchased by Count Peter Geiden, a prominent nobleman of liberal political beliefs. He not only carefully restored the mansion and its furnishings but also added an extensive collection of European paintings. After the 1917 revolution, the estate was nationalized and the contents of the mansion dispersed. Remarkably, the architectural ensemble survived not only the turbulent years of revolutionary conflict, but also the terrible battles in the Vyazma area during World War II. For much of this time between Fall 1941 and Spring 1943, the mansion served as German staff headquarters. After the war, a series of careless missteps resulted in a major fire and the estate barely avoided being completely demolished. Fortunately, the noted restoration specialist Petr Baranovsky (1892-1984) brought an end to the outright destruction of the property in the late 1960s. However, the long process of restoration began only with the involvement of Victor Kulakov, a former mechanic who by happenstance became acquainted with Baranovsky and the Khmelita project. Through ceaseless efforts during the 1990s, the resurrection of the mansion and estate ensemble took its course under the direction of Kulakov. 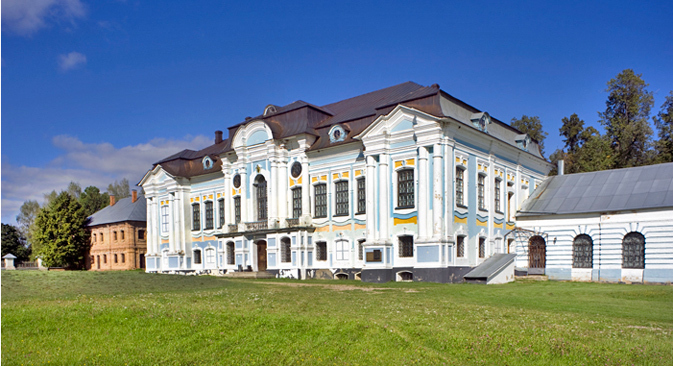 The mansion has now been superbly restored and serves as a museum dedicated to Alexander Griboyedov. Where possible, original decorative detailing has been preserved on the interior, and the rooms on the main floor have been elegantly refurnished in the style of the early 19th century. The mansion’s park façade once again opens onto an appealing landscape park. Reconstruction work continues on the ensemble’s service buildings and the Church of the Kazan Icon of the Virgin. One of the nearby service buildings has been converted to a museum devoted to Admiral Pavel Nakhimov (1802-55), known above all for his heroic efforts in the defense of Sevastapol during the Crimean War. Nakhimov was born at the neighboring estate of Gorodok, which, like most country estates, did not survive the turbulence of the 20th century. Beautifully situated and accessible over good roads, Khmelita welcomes all visitors interested in the rich cultural history of the Russian country estate.